Anyone who knows my work as a business coach for actors knows that I speak about mindset… a LOT. It is single-handedly the biggest factor determining if an actor finds any success in an acting career or not. Mindset is a topic that covers every single corner of an actors career, yet is rarely discussed or worked on in traditional acting schools, classes, and training. One of the possible reasons for this is because it feels so much better to work on tasks outside of oneself like getting a new agent, headshot, or acting class instead of working on what’s going on in the inside. When we spend time working on ourselves as human beings… we become more aware and often start admitting to ourselves that our lives are up to us. And that can be terrifying to many people. But when actors place the burden of their careers success on the shoulders of their reps… or something else outside of themselves like their looks or finances or circumstances, It can feel much better to have someone else or something else to blame when things don’t work out. Let’s look at a much more specific sub-section of Mindset …namely baggage. There are so many things that actors have control over in their careers. And many things that they do not have control over as well. One of the great challenges in an actor’s life is to work on the things that you CAN control and STOP WORRYING about the things that you cannot control. One of the many factors that go into consideration when hiring an actor is if any issues or baggage come attached to that actor. * A flustered actor blaming traffic for their tardiness in an audition. * An actor bad-mouthing their former reps in an interview with a new potential agent or manager. * An actor appearing too needy or green while giving their slate or talking to a Casting Director. THOSE are three examples that you have control over and can work on. * The project an actor is auditioning for is under union jurisdiction but the actor is currently a non-union actor and the producers are not interested in making anyone eligible. * An actor had a bad reputation for a while because they were doing drugs and getting into trouble and the media surrounding them has not caught up to their new image and healthier lifestyle yet. * There can even be baggage that has absolutely nothing to do with the actor at all. Sometimes it can be the internal baggage of the decision makers. Like maybe you remind the director of their soon-to-be ex and they are going through a nasty divorce. In a circumstance like that, there is really nothing that you can do. And worse, you will probably never know why you didn’t get the job. So whatever form baggage might show up as in your career, whether it is your baggage or someone else’s, no matter what the circumstances … Be prepared, do your best, and then move on. Work on yourself and your mindset on a daily basis and get really skilled at leaving the nonsense behind. Your baggage served its purpose in the past but you no longer need it. It was here to protect you. But it no longer serves you and you no longer need it. 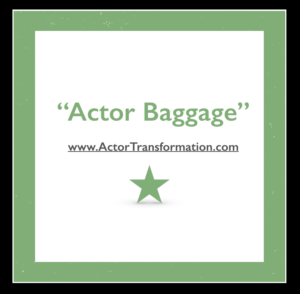 So ….Pack those imaginary bags with all of your actor fears, doubts, insecurities, self-sabotage, procrastination, worry, and beyond. And send your baggage packing!